This tutorial shows how to add slicer to tables, pivot tables and pivot charts in Excel 2010, 2013 and 2016. We will also explore more complex uses such as creating a custom slicer style, connecting one slicer to multiple pivot tables, and more. Excel PivotTable is a powerful way to summarize large amounts of data and create summary reports. To make your reports more user-friendly and interactive, add visual filters, aka slicers, to them. Hand off your pivot table with slicers to your colleagues and they won't bother you each time they want the data filtered differently. 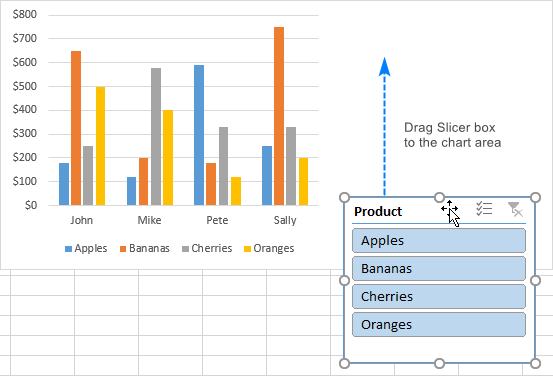 Slicers in Excel are graphic filters for tables, pivot tables and pivot charts. Due to their visual qualities, slicers fit especially well with dashboards and summary reports, but you can use them anywhere to make filtering data faster and easier. Slicers were introduced in Excel 2010 and are available in Excel 2013, Excel 2016 and later versions. Pivot table filters a bit clumsy. 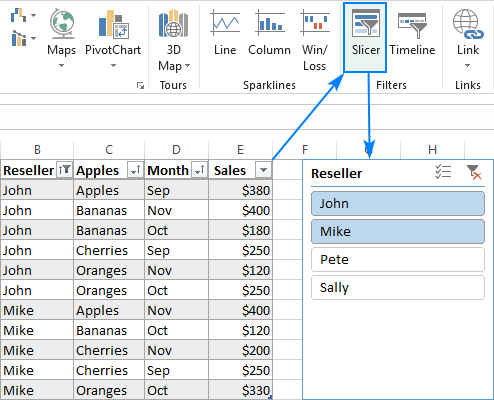 With slicers, filtering a pivot table is as simple as clicking a button. 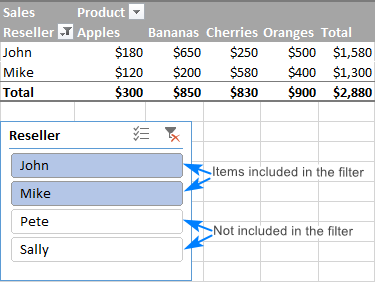 Filters are tied to one pivot table, slicers can be connected to multiple pivot tables and pivot charts. Filters are locked to columns and rows. Slicers are floating objects and can be moved anywhere. For example, you can put a slicer next to your pivot chart or even within the chart area and have the chart contents updated in real time on a button click. Pivot table filters may not work very well on touch screens. Slicers perform great in touch screen environments. Pivot table report filters are compact, slicers take up more worksheet space. Pivot table filters can be easily automated with VBA. Automating slicers requires a bit more skills and efforts. 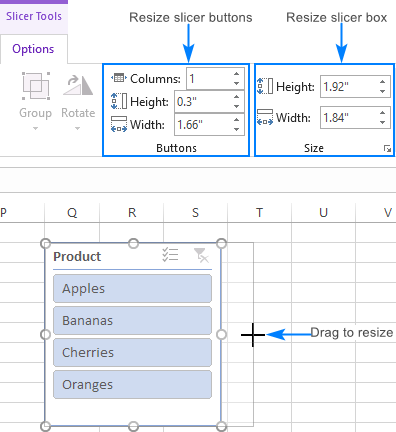 To get started with slicers, please follow the below guidelines that show how to add a slicer for your Excel table, PivotTable, or PivotChart. Click anywhere in the pivot table. 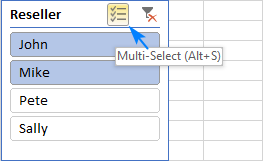 In Excel 2013 and Excel 2016, go to the Analyze tab > Filter group, and click the Insert Slicer In Excel 2010, switch to the Options tab, and click Insert Slicer. The Insert Slicers dialog box will pop up and show the checkboxes for each of your pivot table fields. Select one or more fields for which you want to create a slicer. Click anywhere in your table. On the Insert tab, in the Filters group, click Slicer. In the Insert Slicers dialog box, tick off the check boxes for one or more columns that you want to filter. 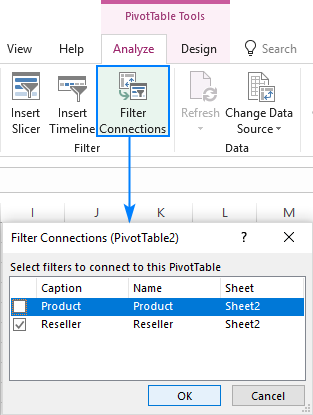 To be able to filter a pivot chart with a slicer, you can actually make a slicer for your pivot table like explained above, and it will control both the pivot table and the pivot chart. Click anywhere in your pivot chart. On the Analyze tab, in the Filter group, click Insert Slicer. Select the checkboxes for the slicer(s) you want to create, and click OK.
Once you have a slicer, you can use it to filter the pivot chart data straight away. Or, you may want to make a few improvements, for example, hide the filter buttons on the chart, which have become redundant since you are going to use the slicer for filtering. Tip. If the slicer box gets hidden behind the chart, right-click the slicer, and select Bring to Front from the context menu. Excel slicers were designed as user-friendly filter buttons, so their use is simple and intuitive. The below sections will give you some hints on how to get started. 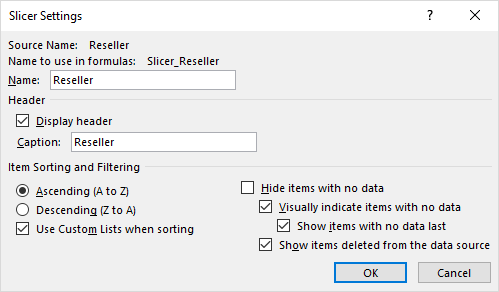 Once a pivot table slicer is created, simply click on one of the buttons inside the slicer box to filter your data. The pivot table will update immediately to show only the data that matches your filter settings. To remove a specific item from the filter, click the corresponding button in the slicer to unselect the item. If multiple slicers are connected to the same pivot table and clicking a certain item inside one slicer makes some items in the other slicer greyed out, that means there is no data to display. Click the slicer buttons while holding the Ctrl key. Click the Multi-Select button (please see the screenshot below), and then click on the items one by one. Click anywhere inside the slicer box, and press Alt + S to toggle on the Multi-Select button. Select the items, and then press Alt + S again to toggle multi-selection off. To move a slicer to another position in a worksheet, put the mouse pointer over the slicer until the cursor changes to a four-headed arrow, and drag it to a new position. As with most Excel objects, the easiest way to change the slicer's size is by dragging the edges of the box. Right click the slicer, and then click Size and Properties. 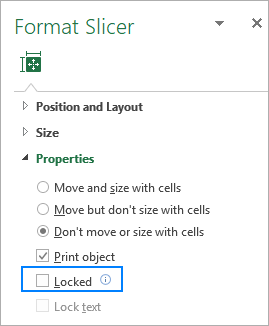 On the Format Slicer pane, under Properties, select the Don't move or size with cells box. 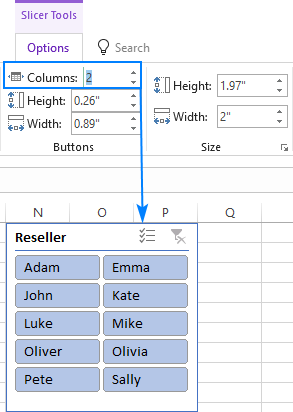 This will keep your slicer from moving as you add or delete rows and columns, add or remove fields from the pivot table, or make other changes to the sheet. Click anywhere in the slicer box, and press the Alt + C shortcut. Click the Clear Filter button in the upper right corner. 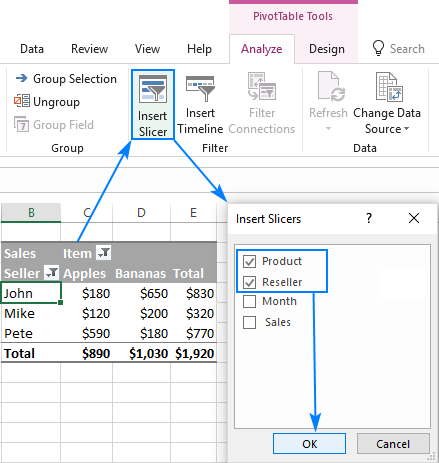 Click anywhere in the pivot table from which you wish to disconnect a slicer. In Excel 2016 and 2013, go to the Analyze tab > Filter group, and click Filter Connections. In Excel 2010, go to the Options tab, and click Insert Slicer > Slicer Connections. 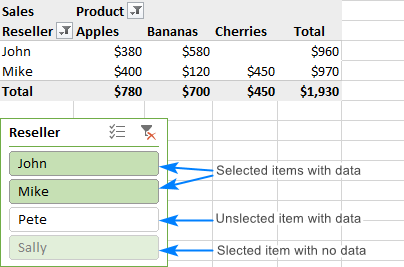 Please keep in mind that it won't delete the slicer box from your spreadsheet but only disconnect it from the pivot table. If you'd like to restore the connection later, open the Filter Connections dialog box again, and select the slicer. This technique might come in handy when the same slicer is connected to multiple pivot tables. Select the slicer and press the Delete key. Right-click the slicer, and then click Remove <Slicer Name>. 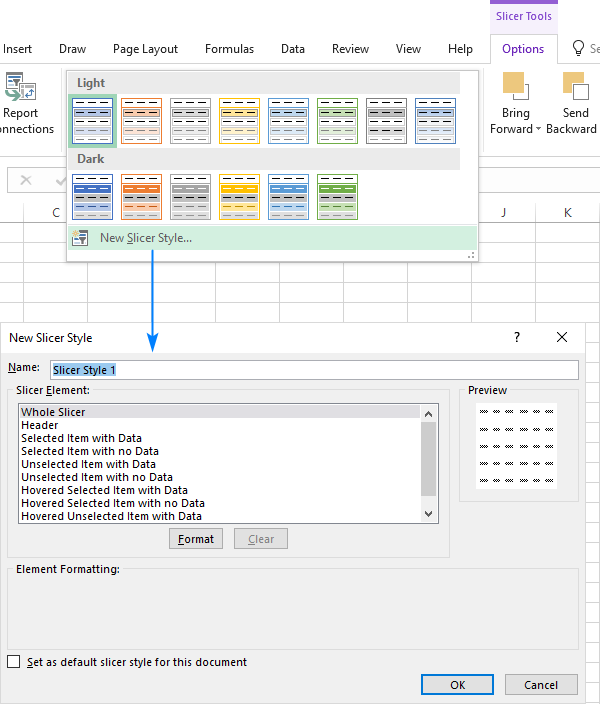 Excel slicers are easily customizable - you can change their look and feel, colors, and settings. In this section, we will focus on how you can refine a slicer that Microsoft Excel creates by default. Click on the slicer for the Slicer Tools tab to appear on the ribbon. On the Slicer Tools Options tab, in the Slicer Styles group, click on the thumbnail you want to use. Done! On the Slicer Tools Options tab, in the Slicer Styles group, click the More button (please see the screenshot above). Click the New Slicer Style button at the bottom of the Slicer Styles gallery. Give a name to your new style. Select a slicer element, click the Format button, and choose the formatting options for that element. When finished, move on to the next element. Click OK, and your newly created style will appear in the Slicer Styles Gallery. "With Data" elements are slicer items associated with some data in the pivot table. "With no Data" elements are slicer items for which there is no data in the pivot table (e.g. the data was removed from the source table after a slicer was created). If you are keen to create an awesome slicer design, but don't know where to start, choose the inbuilt style closest to your idea of a perfect slicer, right click it, and select Duplicate. Now, you can customize individual elements of that slicer style to your liking and save it under a different name. Since custom styles are saved at the workbook level, they are not available in new workbooks. To overcome this limitation, save the workbook with your custom slicer styles as an Excel Template (*.xltx file). When you create a new workbook based on that template, your custom slicer styles will be there. With the slicer selected, go to the Slicer Tools Options tab > Buttons group. In the Columns box, set the number of columns to show inside the slicer box. Optionally, adjust the height and width of the slicer box and buttons as you see fit. Now, you can select the slicer items without having to scroll up and down. The slicer was set up in 4 columns. The slicer header was hidden (please see the instructions below). 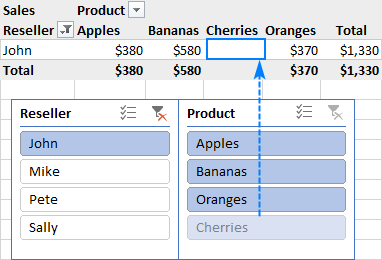 A custom style was created: the slicer border was set to none, the border of all items and the fill color of the "Selected item with data" was set to match the color of pivot table's header row. Please see How to create a custom slicer style for more details. Hide the slicer header by clearing the Display header box. Sort slicer items ascending or descending. Hide items with no data by unselecting the corresponding box. Hide items deleted from the data source by clearing the relevant check box. With this option unchecked, your slicer will stop showing old items that were removed from the data source. Create two or more pivot tables, ideally, in the same sheet. Optionally, give meaningful names to your pivot tables so that you can easily identify each table by its name. 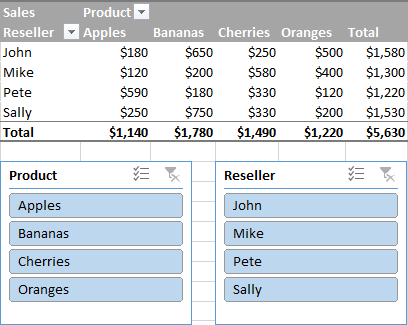 To name a pivot table, go to Analyze tab and type a name in the PivotTable Name box in the top left corner. Create a slicer for any pivot table as usual. 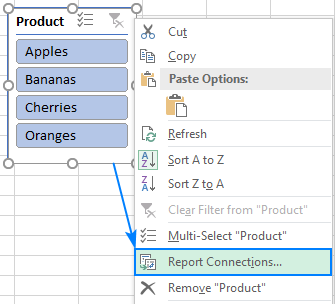 Right click on the slicer, and then click Report Connections in Excel 2016 and 2013 (PivotTable Connections in Excel 2010). Alternatively, select the slicer, go to the Slicer Tools Options tab > Slicer group, and click the Report Connections button. 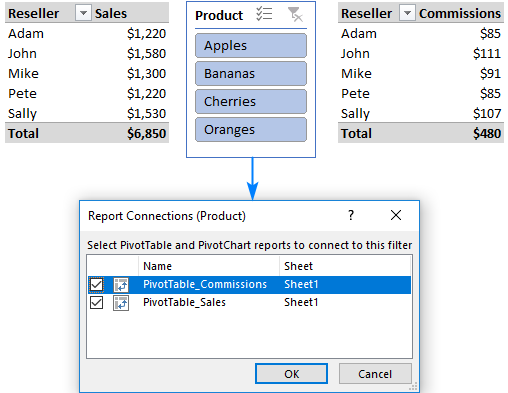 In the Report Connections dialog box, select all the pivot tables you want to link to the slicer, and click OK. Note. 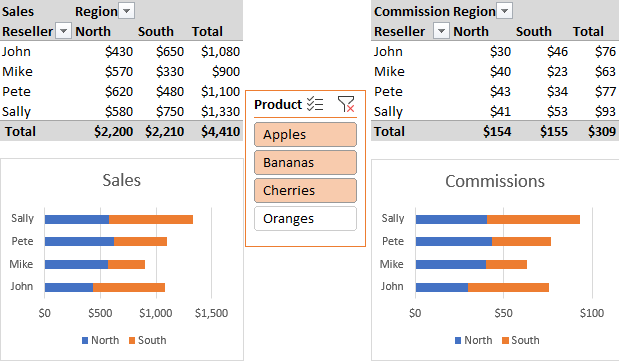 One slicer can be connected only to those pivot tables and pivot charts that are based on the same data source. To unlock more than one slicer at a time, hold the Ctrl key while selecting the slicers. Right click on any of the selected slicers and select Size and Properties from the context menu. On the Format Slicer pane, under Properties, uncheck the Locked box, and close the pane. On the Review tab, in the Protect group, click Protect Sheet. 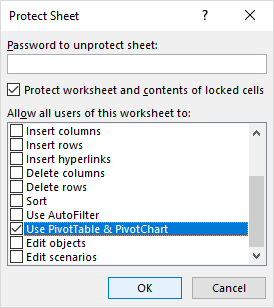 In the Protect Sheet dialog box, check the Use PivotTable & PivotChart option. Optionally, enter a password and click OK. Please see How to protect and unprotect Excel worksheet for more information. 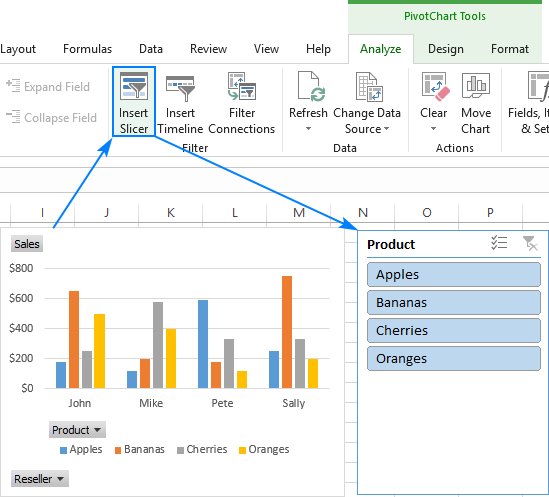 Now, you can share your worksheets even with Excel novices without worrying about the safety of your data - other users won't mangle the format and layout of your pivot tables, but will still be able to use your interactive reports with slicers. I hope this tutorial has shed some light on how to insert and use slicers in Excel. 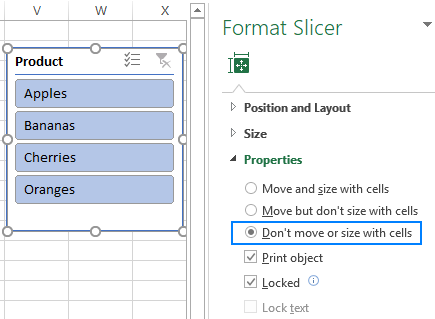 To gain more understanding, you are welcome to download our Excel Slicer Examples. I thank you for reading and hope to see you on our blog next week! 9 Responses to "Excel slicers for pivot tables and charts"
Svetlana Cheusheva, thanks a lot for the post.Really thank you! Much obliged. To my best knowledge, it's not possible. Can you explain how to use a slicer selection in vlookup? I want to reference the slicer value across a difference data set to return a value. In the graph, where did the North and South parameter came from. I didn't see it from the data. Can you please let me know if there is a way to make axis in pivot chart not scale as we use slicer ? As an example, if you use slicer for axis values, choosing only 1 item in slicer will lead to a very large 1 data column. Is there a way to fix the scale or maybe find some workaround for mentioned issue ? After some filtering of the zoom on my dashboard, the slicer features such as the scroll bar and multi select/clear filter buttons are incredibly small. Is there anyway to resize these?